The Smashbox Art. Love. Colour. Master Class III Palette for Holiday 2015 palette was an impulse buy for me. It contains a mix of 32 neutrals, khakis, purples and brights, as well as six blushes and highlighters. 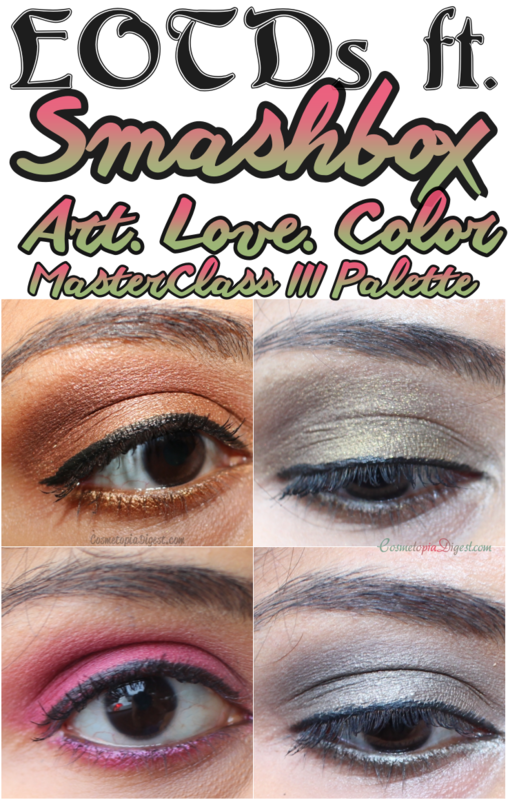 I had not tried previous Master Class palettes. The only other Smashbox palette I have used before is Double Exposure, which I love. The Holiday 2015 Smashbox Master Class III palette has been designed by drop-dead gorgeous Spanish painter Yago Hortal Hernandez. To be honest, and this is purely subjective, the design of the palette does not scream "Christmas" to me, and looks summery and bright. But let us concern ourselves with the inside of the palette. Scroll down for the review, eye makeup looks and swatches of the Smashbox Art. Love. Colour. Master Class III Palette for Holiday 2015. The Smashbox Master Class 2015 palette contains 32 Photo-Op Eyeshadows, six blushes, two highlighters and get the look cards. The palette itself is packaged like a DVD Boxed Set. Inside, you have an info card about Yago Hernandez, four look cards featuring eight tutorials, and the palette itself. See what I mean about the DVD set? Now for the palette itself. Do not be alarmed, ye neutral lovers! Six of those are blushes while two of those are highlighters. I would have liked to see a bronzer as well, but you cannot eat the cake et cetera, et cetera. The pans are covered by plastic lids which feature the names of each shade. Blushes get the biggest pans. There are 32 eyeshadows, arranged in columns of four complementary shades. The pans decrease in size according to colour - paler shades get bigger pans. Here is the second "page" of the palette. The purples and blues are here, as also the greys, silvers and pales. The blushes and highlighters are top class! You cannot get better than this. All the blushes are shimmer-free, just as I like them. The blushes are so pigmented that you can easily use them as eyeshadow. As blushes, however, you need to be careful about product overload! There is a nice mix of matte, pearly and shimmery shadows with four chunky glitters. I always wear primer on my lids so I have not noticed creasing or fading. Honest injun! The eyeshadows: Out of the 32 shades, the four chunky glitters are clumpy, dry and hard to swatch without primer. Of these, two are duddy-duds that do not work well even with primer. Here are finger-swipes of Orchid, Zoom, Pacific and Torch. Not bad at all! Here are the two disasters I told you about - Charmed and Cosmic. These do not blend on my eyelids. Thankfully, both are pale, glittery shades that look awful on me, so I hardly ever reach for them. I had to swirl my fingers around the pan to get these results. Swatches are in two batches - the first set contains all the bright eyeshadows. The second contains the paler ones and the blushes and highlighters. Let's go! In sunlight, on bare skin. No primer! Sky, Sea, Charmed and Cosmic are, thankfully, similar pales I rarely reach for. In any case, I prefer matte or at least satin eyeshadows and avoid chunky glitter like the plague. The blushes, as you can see above, are amazingly pigmented! I have used Sunset on my lids with good results. On the cheeks, the barest touch will do. I have an FOTD post to show you next week, featuring this palette. Torch, Nutmeg and Sunset (blush), with Alabaster in the inner corner (for the first three looks). Taken indoors with flash, artificial dim light. Spruce and Goldenrod. Outdoors, in sunlight. Steel and Cement. Indoors, artificial light. Framboise, Candy and Naked. Natural daylight, in car. The pink bit in the middle of my iris is where some eyeshadow got in my eye and my camera picked it up. Ugh! The Smashbox Art. Love. Colour. Holiday 2015 Master Class Palette is among my favourite Holiday 2015 palettes, and with good reason. Of the 32 eyeshadows, 28 are lovely; the four chunky glitters aren't as pigmented, especially Charmed and Cosmic, which are hard to work with - few chunky glitter shadows ever work for me anyway and I cannot pull off such pale shades. I can live with that proportion. The blushes are all brilliant, as are the highlighters. Some of the shadows have fabulous pigmentation and look gorgeous. This is, IMO, a complete palette. Shade-wise, I love that there is a good mix of neutral-ish, wearable shades, as well as some pops of teal, purple, blue and green thrown in for those who love colour in their lives. I am going travelling next week, so this is the only palette I will be taking along. My parents are celebrating their wedding anniversary on the 4th, so I can do with a nice teal EOTD for the dinner out. I cannot count the number of palettes/products/singles you would need to buy to get six great blushes, two highlighters and some 28 pigmented eyeshadows (and four chunky glitters), so this is a good investment. The quality is impressive for a palette of this size. Usually, the more the product, the poorer the quality. Unless you WANT four pale chunky glitter eyeshadows, I highly recommend this as a complete blush and eyeshadow palette, either for yourself or as a much-appreciated gift. Sephora sells it here for $65. For those across the pond, get it online from Smashbox here for £55. If you are looking for a treat on Black Friday/Cyber Monday, this is a great choice! Are you a Smashbox fan? Do you love or hate their eyeshadows? Tell me in the Disqus comments widget below.